Directions: Pleasant View Church is located at the corner of Upper Jamestown Road and Pleasant View Road. From Jeffersonville, take OH-734 West for 4 miles to Pleasant View Road and turn north (right). Travel 1 mile to the church. From Jamestown, take OH-734 East for 5 miles to Pleasant View Road and turn north (left). Travel 1 mile to the church. Location and Directions: Farm A is located on the west corner of Edgefield Road and Jenks Road. From the junction of I-71 and Old US-35/OH-435 W. near West Lancaster, travel on Old US-35 West for 2 miles to Edgefield Road. Turn south (left) and travel 1Â½ miles to Tract 1. Turn right on Jenks Road to Tract 2 on the curve (across from Tract 1). Tract 1 â?? Located along Jenks and Edgefield roads. 110Â± acres of mostly tillable cropland. Brookston, Crosby, and Celina are the predominate soil types of this prime, level, continuous field. Tract 2 â?? Located along Jenks Road. 24.5Â± acres of primarily Brookston soils. This farm provides easy access, quality cropland, and a great location. 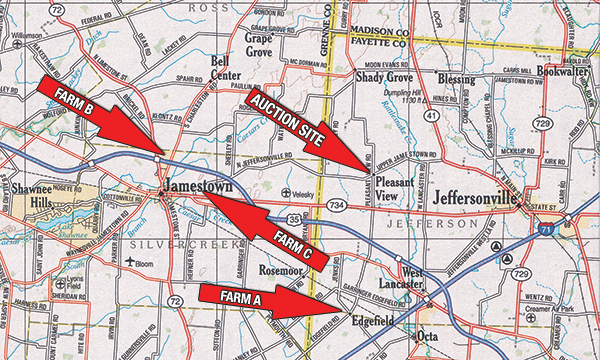 Location and Directions: Farm B is divided on both sides of US-35 and bordered by N. Limestone Street/OH-72 and S. Charleston Road in Jamestown. From Jamestown, travel north on S. Charleston Road for 1+ mile to Tracts 3, 4, and 5. Tract 3 â?? Located along S. Charleston Road. 42.5Â± acres with 38Â± acres tillable. This tract features Ragsdale, Reesville, and Xenia loamy soil types. Tract 4 â?? Located along S. Charleston Road with a 2nd point of access from Greenview Street. 18+ acres of Ragsdale, Reesville, and Xenia soils. Investigate the income potential offered here with excellent soils in a location that offers many opportunities. Tract 5 â?? Located along S. Charleston Road. 23Â± acres of mostly wooded land with mixed hardwood trees. Consider the recreational/hunting value as well as the possibility of a beautiful building site. Location and Directions: Farm C is located on the corner of OH-734 and Jeffersonville Road on the east edge of Jamestown. From Jamestown, travel east on Old US-35 for 1 mile to OH-734 and turn left. At Jeffersonville Road, turn north (left). Tract 6 is on the corner and Tract 7 is past the curve. Tracts 8 and 9 are adjoining between Tracts 6 and 7. Tract 6 â?? Located at the corner of OH-734 and N. Jeffersonville Road. 9.5Â± acres of cropland. The predominate soils types are Brookston, Miamian, and Celina. Investigate the opportunity to build your country estate on this gently rolling tract. Tract 7 â?? Located along N. Jeffersonville Road. 3.4Â± acres with Miamian and Celina soils. Combine tracts 7, 8, and 9 for 25Â± acres of income producing real estate. Tract 8 (SWING TRACT) - 15.6Â± acres with Brookston, Miamian, and Celina soils. Tract 8 must be bid in combination with Tract 6 and/or Tract 7 or by an adjoining land owner. Tract 9 (SWING TRACT) â?? 6Â± acres of primarily Brookston soil. Tract 9 must be bid in combination or by an adjoining land owner. Consider this rare opportunity to combine the tracts in Farm C in a manner that best suits your needs. Located along Jenks and Edgefield roads. 110Â± acres of mostly tillable cropland. Brookston, Crosby, and Celina are the predominate soil types of this prime, level, continuous field. Located along Jenks Road. 24.5Â± acres of primarily Brookston soils. This farm provides easy access, quality cropland, and a great location. Located along S. Charleston Road. 42.5Â± acres with 38Â± acres tillable. This tract features Ragsdale, Reesville, and Xenia loamy soil types. Located along S. Charleston Road with a 2nd point of access from Greenview Street. 18+ acres of Ragsdale, Reesville, and Xenia soils. Investigate the income potential offered here with excellent soils in a location that offers many opportunities. Located along S. Charleston Road. 23Â± acres of mostly wooded land with mixed hardwood trees. Consider the recreational/hunting value as well as the possibility of a beautiful building site. Located at the corner of OH-734 and N. Jeffersonville Road. 9.5Â± acres of cropland. The predominate soils types are Brookston, Miamian, and Celina. Investigate the opportunity to build your country estate on this gently rolling tract. Located along N. Jeffersonville Road. 3.4Â± acres with Miamian and Celina soils. Combine tracts 7, 8, and 9 for 25Â± acres of income producing real estate. (SWING TRACT) - 15.6Â± acres with Brookston, Miamian, and Celina soils. Tract 8 must be bid in combination with Tract 6 and/or Tract 7 or by an adjoining land owner. (SWING TRACT) â?? 6Â± acres of primarily Brookston soil. Tract 9 must be bid in combination or by an adjoining land owner. Consider this rare opportunity to combine the tracts in Farm C in a manner that best suits your needs. PROCEDURE: The property will be offered in 9 individual tracts, any combination of tracts and as a total 252.5Â± acre unit. There will be open bidding on all tracts (with swing tract limitations) and combinations during the auction as determined by the Auctioneer. Bids on tracts, tract combinations and the total property may compete. POSSESSION: Possession at closing with tenantsâ?? rights of the 2016 crop. Seller shall retain cash-rent for the 2016 crop year. SURVEY: New surveys shall be prepared for each farm location by Cottrill Surveying LLC. The pre-auction perimeter survey and the post-auction survey costs shall be shared equally between the Buyer and Seller. The type of survey provided will be at the Sellerâ? ?s option. Combination purchases will only receive a perimeter survey.